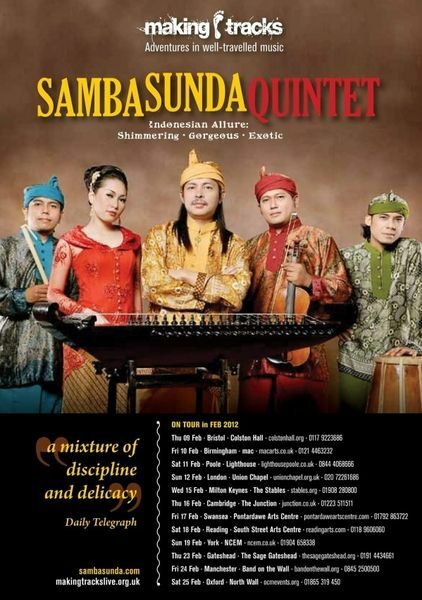 Indonesia Gamelan innovators, the SambaSunda Quintet are still currently performing in the UK as part of the Making Tracks Tour 2012. Making Tracks is a fresh concept in programming on the British live music circuit launched in Autumn 2010. A travelling season of concerts bringing the newest and most exciting music from around the globe to a local setting in partnership with 12 major music venues in the UK. Season Two kicked off with the Caribbean roots of Aurelio. 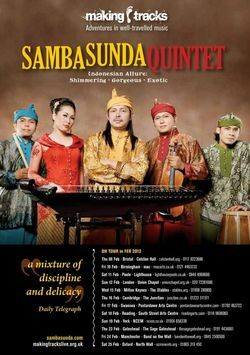 Now Making Tracks is off to Indonesia with gamelan innovators SambaSunda Quintet (09-26 Feb 2012), followed by young oud star Khyam Allami and his new commission project, DoubleDuo (12-29 April 2012).